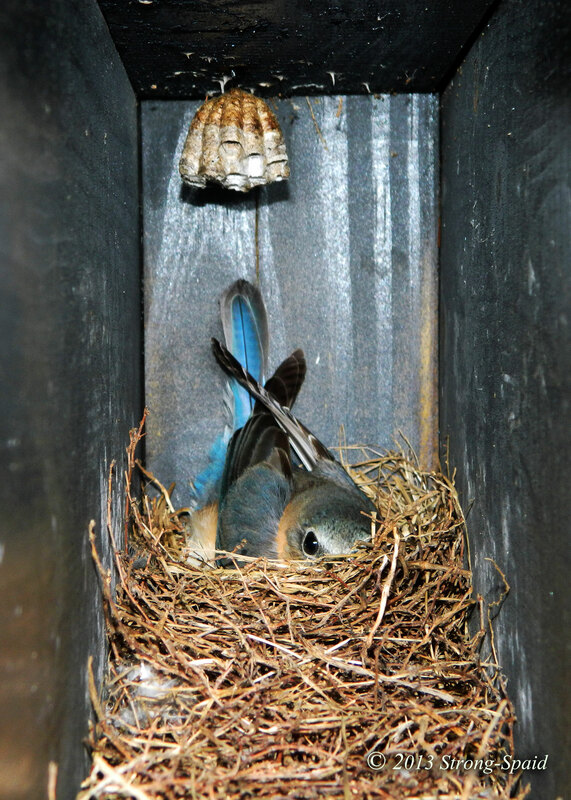 Each spring, bluebirds move into the narrow newspaper holder beneath our mailbox. Even though we don’t get the newspaper, it isn’t the safest place for them to live. Without looking, people drive by and shove advertisements over their nest and cover it up. So every day, out of concern, we check to make sure the birds can still get in and out. This spring, I decided to buy a real bluebird house and hang it on a nearby tree. I thought they would prefer to move into something a little safer, made just for them. But no! Once again, the bluebirds chose to build their nest inside the newspaper holder—complete with a designer paper wasp chandelier. Oh well. At least the standard bird house that I bought didn’t go to waste. A huge spider eventually came wandering by and decided it was the perfect place to live. Not exactly what I had envisioned, but I’m glad that the spider appreciates the shelter. 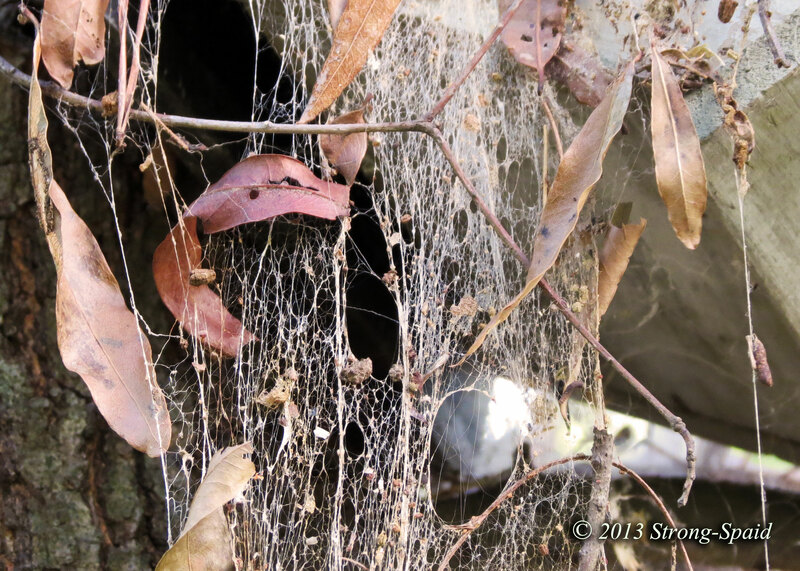 Now tilted and decorated with webs filled with fallen autumn leaves, the spider’s house looks eerily haunted. Happy Halloween! 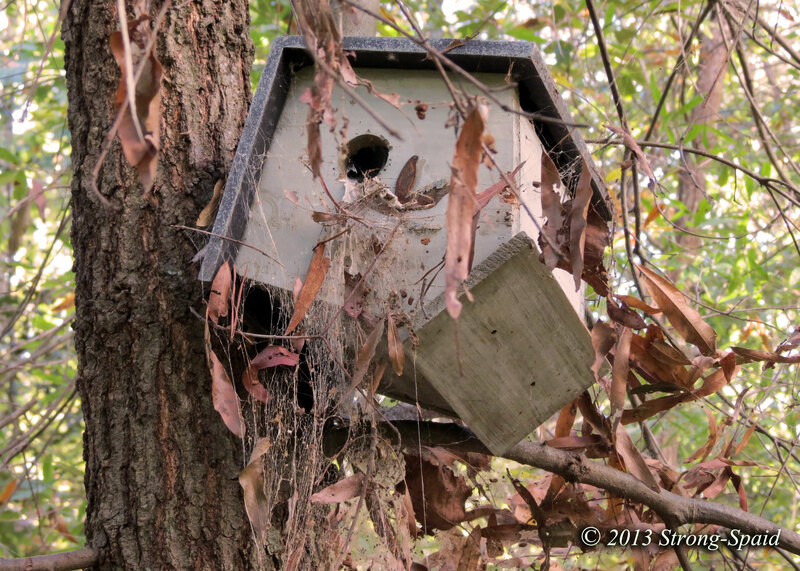 This entry was posted in birds, Halloween, Nature, Photo Essay, photography, wildlife and tagged autumn, Fall, Spiders. Bookmark the permalink. Did you face the bluebird house to the south? My dad always told me that was the key to getting bluebirds in there. Not sure if that is true or not, but every bluebird house my parents have had faced south and always has bluebirds in the spring! My mailbox and newspaper holder face west. The afternoon sun hits it full force (and it’s black). I don’t know why the eggs don’t end up hard boiled! But every year, they move in there. Actually, the bluebird house that I hung on the tree did face south, but they still built their nest in the newspaper holder. That’s interesting. I guess my dad told me that when I was a kid just to shut me up! Maybe they liked the warmth? Either way it is fun to watch bluebirds grow up in the spring. Haha those are always good memories when you get older and realize your parents told you some crazy things. Oh…I have problems with the wrens too. At the top of the post on my front porch. What a mess they make! This year, I put a little statue of a cat up there. I didn’t think there would be enough room to make a nest. But….they managed to squeeze behind the little statue. They are gone now, but they left the nest and the bird poop everywhere. I still need to get the ladder and go up there with a sponge and some soapy water. Sigh. I failed on both counts. I could not even lead the bird, much less make it nest there. Someone told me that bluebirds are creatures of habit, and once they choose a place to nest….they will come back again to the exact same place if possible. Mary – wonderful story as always. So glad you keep writing and taking awesome pictures!!!! Wonderful photos Mary! The bluebird mom looks so happy in her newspaper house. And the vacant dwelling is really scary! I have read that not only should the bluebird house face south, it should be placed about 5 or 6 feet high (like fence height) and overlook an open pasture or lawn. My, they are fussy lil critters. They are also picky so their old nests (or any other debris) has to be cleaned out. They often nest more than once in a season in the same house (if it’s clean). Do I sound like I know what I’m talking about? Your guess is as good as mine. The news paper holder is about three and a half foot high….I’m not sure though. And it sits on the edge of the road, overlooking asphalt. My husband diligently watches over the birds when they show up. One time, he even bought them some little crickets and put them at the entrance. He cleans out the nest after they have gone and then, of course, they come back again. The bad thing about the newspaper holder is the location. Not only do papers get shoved in there—but one morning, we found the entire nest lying on the ground. Maybe some kids did it, I don’t know. There were still 2 tiny bluebirds sitting silently in the nest. The other 2 were close by, struggling to move across the rocky ground. They only had a few small feathers. We gathered them up, and put the nest and the little baby birds back in the newspaper holder, hoping the mom and dad would come back and take care of them. Luckily, they did. I thought for sure, after that, the bluebirds would never build a nest there again (I wouldn’t have). But I was wrong. Next time around, they moved right back in there again. Love the chandelier. We have several bluebird houses around the yard and some are inhabited. The purple martins give them strong competition for the houses even though they are not at the type martins usually go for and the bluebirds finally give up and go away. I’m not sure if I have ever seen a purple martin. We did have a Hawk nest in our back yard this spring and summer. The little baby hawks were quite noisy (hungry). The adult hawks picked off quite a few passing birds while they were in flight. But they didn’t bother the bluebirds who hung out in the front yard, near the road. Maybe that’s why the bluebirds continue to choose to nest in the newspaper holder? Who knows. Thank you for visiting my blog ! I do think that yours is a splendid blog. I am now following. Thanks for the follow, Vera! I appreciate your ability to tell a story as you do! I really enjoy your detailing in word and image–the humor of the “designer paper wasp chandelier” and the bird (a.k.a. spider) house decked out for Halloween! Thanks Marso….glad you like the story. I don’t blame you, I’m not a fan of spiders either. Have a peek at what we had in our letterbox a year or so ago. Oh my! At least the snake left its tail hanging out as a warning. Posted the link to your story on my Facebook page, so I am sure you will be getting a few views. Great photos. Love the cute little green frogs. Wonderful photo. Hard to change a bird’s mind once it finds a nesting place it likes! Guess we can’t argue with success! Mama bird looks very comfortable there. Has a mind of her own, that’s for sure! Maybe he’s a nice guy. I do think the bluebirds might have been impressed and swayed by the classy chandelier. But I really don’t know what is on the minds of the birds and that big ole’ spider! This is a wonderful post – the little bluebird is so sweet, and I love your “haunted” bluebird house. A few years ago, wrens built a nest in our paper box. I taped a sign to the mailbox, asking passersby not to “shove” anything in there! We taped a little sign on the box…..and people still shoved things in there. Not looking at all, I suppose. Nice Shots, the bluebird mother looks content sitting on her eggs! Lovely bluebird houses you have made. And with their own private restaurant nearby. Doesn’t get better than that!! The picture is adorable..and I too love the humor of the wasp’s nest chandelier!! So different from the bird homes I see around here!! My bluebirds think newspaper holders are perfect bird homes. Why I don’t know. Again, it is a good think that I don’t get the paper. They do seem to feel safe there, although I am not sure why. It is very close to the road with all the cars driving by. BUT where else can you get a paper wasp chandelier!!. She makes my grouchy little M&M spider look sweet by comparison! 🙂 I don’t mess with the black widows.